Komatsu developed the first domestically produced TE refrigerator in 1958, approximately 50 years ago. The conceptual diagram is shown in Fig. 1, and you will find it is very simple because of water cooling type. Because the refrigerator could be made by just sandwiching TE panels with a radiation plate and a water cooling block. It was not strange even if all thought it was a product of a dream which would replace the compressor type refrigerator. (Adapted from Journal of spplied physics, Japan, Vol29, No6, P389? The capacity of the refrigerator which we developed was small with 35L(Photo.1). 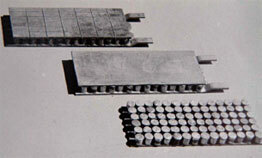 The TE panel consisted of 42 pairs of TE elements. When the refrigerator was run without any stuff inside, the temperature inside was lowered after 2 hours to -2°C for the ambient temperature of 20°C and -6°C when 30°C. When it was operated with 3L water inside to assume?some stuff to be refrigerated, the water was cooled to 10°C after 2 hours and to 4°C after 5 hours with the ambient temperature of 20°C, which demonstrated the refrigerator could function. However the electricity consumption increased to around 7 to 8 times bigger compared to that of the compressor type. TE panels similar to the used panels. This low performance came partly from poorer performance of the TE used in the system compared to the best one developed at that time. But even if we had used the best TE, we would have needed 5 times more electricity. In addition, the manufacturing cost was high because it was necessary to use expensive rare metals for the element materials while the structure of the refrigerator was quite simple. Then, they concluded that it was extremely difficult for a TE type refrigerator to compete with a compressor type. It was, even if we think now, a reckless challenge to replace all compressor type refrigerators by TE types. After this, they changed point of development from replacement of a compressor type by a TE type to finding out other applications which can utilize one or two of the following main features of the TE cooling as the key success factor. Some of those challenges are successfully accepted by the market. No vibration and noise without having moving parts. Can make as small as you want without sacrificing the performance. Can easily adjust the cooling capacity by changing the electric current. Can be easily used for both cooling and heating by changing the direction of the electric current. The first on the list will be the wine cellar. Komatsu made 10 sets of TE panels for wine cellars by a request from one of major consumer electronics makers about 30 years ago. At the time, wine was becoming popular as high quality drink. The marketing group targeted this wine cellar to officers of companies listed at the Tokyo Stock Market and estimated with a gloat that the market volume must be very big if all officers of more than 2000 listed companies were assumed to buy the cellar. But It failed to sell miserably. ?It was too early for them to enjoy wine at home. A furniture style wine cellar. (http://www.ixi-milano.com/spec/english2.htm ) But the wine cellar revived about ten years ago when wine was recognized as a stylish drink and also the price came down as even young people could afford. The vibration is most harmful for the wine and the TE wine cellar was accepted as the most suitable cellar. The temperature most suitable to stock wine is 14°C±2°C at which TE can demonstrate good performance. This was a exactly right application. Recently, expensive wine cellars are enjoying popularity as fancy interior in a living room. (Photo. 3). In addition , we can now find out many kind of TE coolers which can serve as wine cellar and wine cooler which can change the temperature from 10°C to 20°C. The market for those is niche but becomes steadily widespread. As another successful example, we can not forget a noise free refrigerator for a hospital and a hotel. I think that there must be many people who experienced that a compressor of a refrigerator started to work suddenly in a hotel room at midnight and woke up. It is a more serious problem at a hospital. We are now easily available for cooled drinks at convenient stores or from vending machines, then only function of cold insulation is necessary for the refrigerator. By having their sight on this, the TE refrigerators for a hotel and a hospital were introduced from some manufacturers including major electronics manufacture and acquired a good reputation. The refrigerator for a hotel room and a patient’s room is personal use with a small capacity and the temperature necessary for just keeping stuff cool is only around 5°C which are in a domain the TE can cope with. This application also fits to a T.
The fact that the very prototypes of these wine cellars and noise free refrigerator for a hotel and a hospital was already developed 30 to 50 years ago teaches us how important the timing of market introduction is. We will introduce next time the products which pursued the above mentioned feature(2) of the TE (very compact coolers) for various purposes.